The sister of a boy filmed being beheaded by Syrian rebels has disputed a claim by a pro-government Palestinian militia that he was not a fighter. The Liwa al-Quds (Jerusalem Brigade) said Abdullah Issa was just a 12-year-old from a poor refugee family who lived in a rebel-held area of Aleppo. His sister later said on Facebook that he was a Syrian from Homs who went to "fight and defend his country". Members of the Nour al-Din al-Zinki Movement are accused of killing him. The group said those responsible were handed over to a judicial committee, and denounced the killing as a "violation". The US, which has provided military support to the Nour al-Din al-Zinki Movement in the past, said it was seeking more information on what it described as "an appalling report". "If we can prove that this was indeed what happened and this group was involved... it would give us pause about any assistance or, frankly, any further involvement with this group," state department spokesman Mark Toner told reporters. What is left after five years of war? 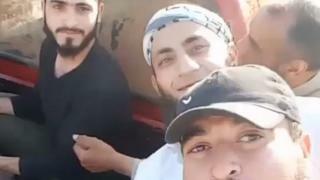 Two short videos emerged online on Tuesday morning showing a boy being taunted and then beheaded by a group of Syrian rebels. The first shows the frightened boy sitting in the back of a pick-up truck, surrounded by five men. From the video he appears to be as young as 10, although other reports suggest he is considerably older. One of the men grips him by the hair as they accuse him of being a member of Liwa al-Quds, a Palestinian militia that fights in support of Syrian President Bashar al-Assad and was involved in clashes with rebels on Tuesday in Handarat, to the north of Aleppo. The second video shows the boy's murder. The Syrian Observatory for Human Rights said the boy was seized by rebels in Handarat, but that the killing took place in Aleppo's Mashhad district. The UK-based monitoring group could not confirm if the boy was a Palestinian or a child soldier. Liwa al-Quds issued a statement on Facebook saying that its investigation had found he was a 12-year-old Palestinian named Abdullah Issa, who lived in Mashhad with his family. It also said he had apparently been receiving medical treatment before being seized, noting that one photograph showed an intravenous drip in his arm. Liwa al-Quds accused the rebels of killing the child simply because he was Palestinian, in order to take "cheap and despicable revenge" for battlefield losses. However, in a Facebook post, his sister, identified as "Zoze Aisa", said she was angry and upset that people were depicting her brother as Palestinian. She said he was a "son of al-Assad", referring to the Syrian president, from the Wadi al-Dahab district of Homs, who went to fight rather than stay behind and receive his medical treatment. The Nour al-Din al-Zinki Movement said it denounced and condemned "such abuses", but insisted they were "individual errors that represent neither our typical practices nor our general policies". "All individuals who undertook the violation have been detained and turned over to the [judicial] committee for investigations in accordance with the relevant legal standards," it added. Earlier this month, Amnesty International published a report detailing a series of violations allegedly committed by Nour al-Din al-Zinki Movement fighters in Aleppo, including abductions and torture.